I never thought I would be a cat person...in fact, I'm still not sure if I actually am! But I have found myself in a little predicament...a stray cat has taken a liking to me...and I think I may be falling for it too! It all started as far back as 3 years ago when I first bought my house. 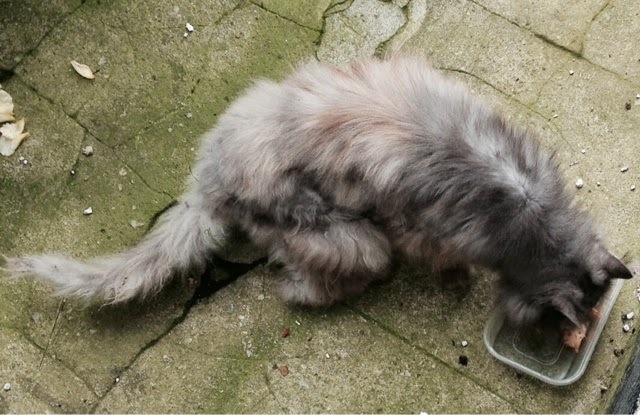 A matted, grey 'angry looking' cat would wait for me as I parked my car and then walk me to my front door, patiently sitting outside on my doorstep as though it was waiting for it to be let in. It would dissapear for a while and then come back sporadically and just sit outside my gate. I couldn't work out if it belonged to my previous owner who was an elderly man, thinking he may of left it behind, but as I was doing up my property and didn't move in until a year and a half later I wasn't able to keep track of it daily. And then a few months ago, it started appearing again, looking more matted and 'straggly' than ever. 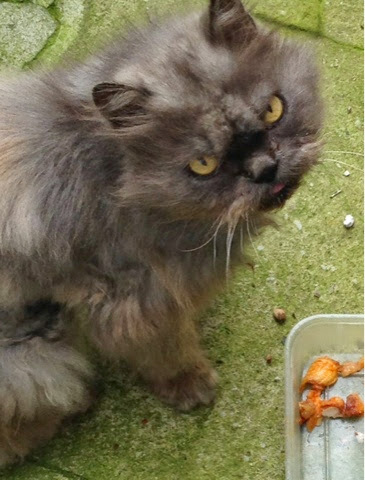 I must admit, it is not the cutest of cats....in fact, it has quite an ugly, scary face! It has really spooked me out on a few occasions as it would just suddenly appear at my feet as soon as I got out of my car and just stare at me with this really mean looking face! (below). 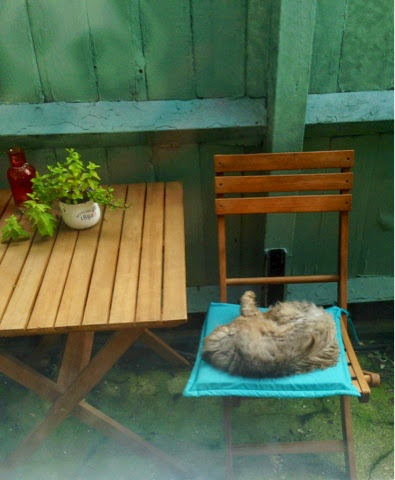 On my days off, I realised that it had started to make a bed during the day on my bistro table set in my back garden and it was during one really cold day when I saw it snuggled up, sleeping on the cushion on my chairs, that my heart pinged and I started to feel sorry for it (title picture). I googled how to look after a stray cat (!) and found out that milk is actually bad for cats as they can be intolerant to it - who knew?! As it was pulling on my heart strings I put out some tinned sardines for it and it guzzled it down before I could even say "Meow"!! Bless it! (I keep saying 'it' as I don't know whether it is a girl or boy!) 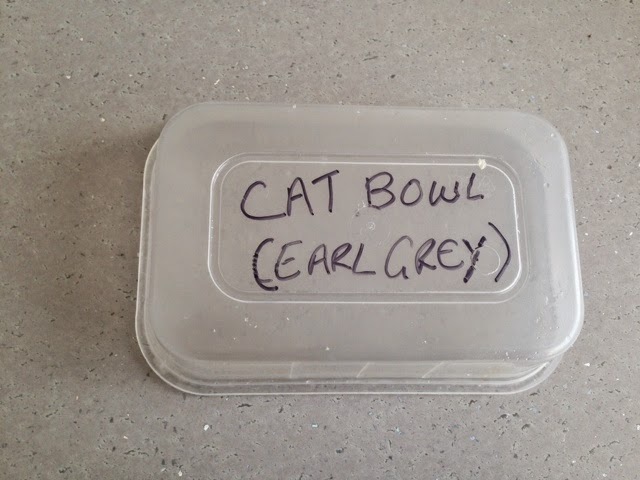 I was telling some friends about 'it' and because it actually has a nice grey fur, one of them came up with the suggestion of naming it 'Earl Grey'.....what a lovely name! Earl Grey, eating some chicken pieces I left out for it! 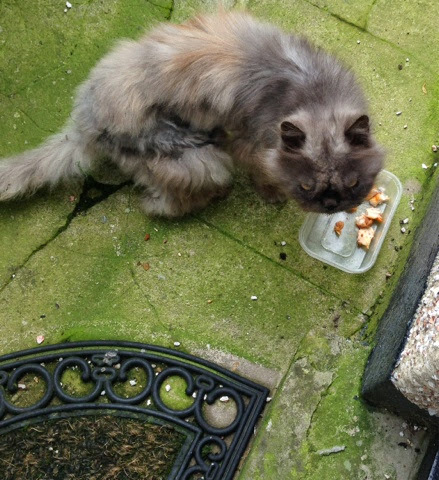 I think it may actually belong to some elderly people a few doors down, perhaps I really should do some further investigation and ensure that this cat has got a proper home to go to before it gets too attached to me! We'll see how we get on with it...it may just be using me as we know cats tend to do! I'll keep you updated with whether I actually do turn into 'Crazy cat lady' after all!